"Nicosia the city of Utopia" | "Λευκωσία, η πόλη της Ουτοπίας"
"Nicosia, the city of Utopia"
Create and view your own printed postal card! Participate in the poster competition! 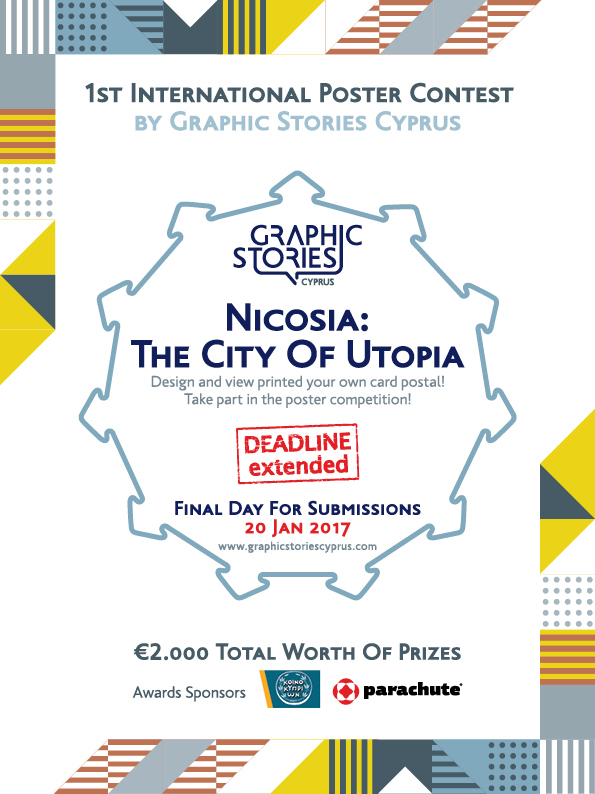 Graphic Stories Cyprus invites higher education students and professionals visual communication designers to create and view printed their own card postal and also to take part in the international poster competition entitled "Nicosia, the city of Utopia". The competition is part of the 3rd Visual Communication Designers Meeting in Cyprus that will take place the weekend between 10-12 of March 2017. The winners will receive €2000 total worth of prizes. The creative idea, conserning the design of the poster, is based on the unique architectural identity of the fortification walls of Nicosia. The castle that surrounds the city was built by the Venetians, in the form it has today, based on Julio Savorgnano's plans during the late Renaissance era. The circular structure of the walls and the geometrical harmony of the final version of the design imply unity and fullness of the city and define the fundamental space not only for the sacred, but also for the popular buildings. During that era many similar structures, such as the walls of Palmanova in north-eastern Italy, were based on the idea that beauty and harmony of the design of a city could enhance the well-being of a community. The designer's expectations did not include only the military protection of the city but also the creation of suitable conditions for the promotion of the well-being and equality of citizens, the preservation of the knowledge gained and its hand over from generation to generation. The basic principles of this utopian foundation of a society are reflected in the design of the Renaissance Nicosia. The competition concerns two separate and independent categories of participants (a) higher education students and (b) professional designers, which will share a common theme. The jury will choose one winner per category. Each of the two winners will receive €1000 worth of prizes, €500 offered by the Bank of Cyprus and a fonts package worth of €500 from Parachute fonts. 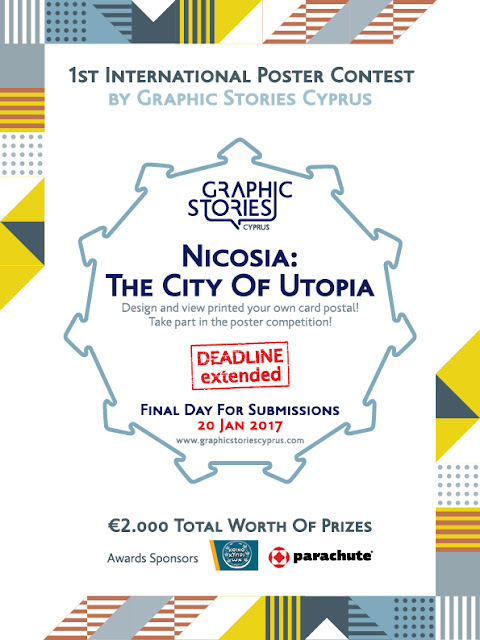 The theme of the competition, "Nicosia, the city of Utopia", and the corresponding exhibition are actions that aim, through the symbolism of the design of the fortification walls, to highlight the history, culture, arts and architecture of a city that was and still remains to this day a crossroad of cultures, arts and literatures, that can contemplate a future without walls and without borders. Σχεδίασε και δες τυπωμένη τη δική σου card postal! Λάβε μέρος στο διαγωνισμό αφίσας! Το Graphic Stories Cyprus διοργανώνει διεθνή διαγωνισμό αφίσας με τίτλο “Λευκωσία, η πόλη της Ουτοπίας” με βραβεία συνολικής αξίας €2000. Παράλληλα καλεί τους επαγγελματίες σχεδιαστές αλλά και φοιτητές της οπτικής επικοινωνίας, να σχεδιάσουν και να δουν τυπωμένη τη δική τους card postal. Ο διαγωνισμός εντάσσεται στο πλαίσιο της 3ης Συνάντησης Σχεδιαστών Οπτικής Επικοινωνίας Κύπρου που θα πραγματοποιηθεί το τριήμερο από 10-12 Μαρτίου 2017. Το δημιουργικό σκεπτικό του διαγωνισμού σε σχέση με τη σχεδίαση της αφίσας, στηρίζεται στον ιδιαίτερο αρχιτεκτονικό χαρακτήρα των οχυρωματικών τειχών της Λευκωσίας. Το κάστρο που περιβάλει την πόλη κατασκευάστηκε από τους Ενετούς, στη μορφή που έχει σήμερα, σε σχέδια του Julio Savorgnano κατά την ύστερη εποχή της αναγέννησης. Η κυκλική δομή των τειχών και η γεωμετρική αρμονία του τελικού σχεδίου υπονοούν την ενότητα και την πληρότητα της πόλης και οριοθετούν τον θεμελιακό χώρο όχι μόνο για τα ιερά, αλλά και για τα λαϊκά οικοδομήματα της. Κατά την εποχή εκείνη πολλές παρόμοιες κατασκευές, όπως τα τείχη της Palmanova στην βορειοανατολική Ιταλία, στηρίχτηκαν στην ιδέα ότι η ομορφιά και η αρμονία του σχεδίου μιας πόλης μπορούσε να ενισχύσει την ευημερία μιας κοινότητας. Οι προσδοκίες του σχεδιαστή των τειχών δεν περιελάμβαναν μόνο την στρατιωτική προστασία της πόλης αλλά και τη δημιουργία των κατάλληλων συνθηκών για την προάσπιση της ευημερίας και της ισότητας των πολιτών, τη διατήρηση της κεκτημένης γνώσης και τη μετάδοσή της από γενιά σε γενιά. Οι βασικές αρχές της ουτοπικής αυτής θεμελίωσης μιας κοινωνίας αποτυπώνονται στο σχεδιασμό της αναγεννησιακής Λευκωσίας. Ο διαγωνισμός αφορά δυο ξεχωριστές και ανεξάρτητες κατηγορίες συμμετεχόντων, (α) φοιτητές και (β) επαγγελματίες σχεδιαστές, ενώ το θέμα είναι κοινό. Η κριτική επιτροπή θα αναδείξει ένα νικητή ανά κατηγορία. Κάθε ένας εκ των δύο νικητών θα λάβει δώρα αξιάς €1000 που αντιστοιχούν σε χρηματικό έπαθλο €500 προσφορά της Τράπεζα Κύπρου και ένα πακέτο γραμματοσειρών αξίας €500 από την Parachute fonts. Για την αξιολόγηση των έργων που θα κατατεθούν έχει συσταθεί κριτική επιτροπή που την αποτελούν καταξιωμένοι σχεδιαστές του χώρου της οπτικής επικοινωνίας. Μέλη της κριτικής επιτροπής είναι οι σχεδιαστές Γιώργος Τσαγγάρης, Περικλής Χριστοφορίδης και Δημήτρης Σωτηρίου από την Κύπρο, ο Χάρης Τσέβης από την Ελλάδα, ο Paolo Guidobono από την Ιταλία και η Rosário Santos από την Πορτογαλία. Τα καλύτερα έργα, που θα επιλεγούν από την κριτική επιτροπή, θα αποτελέσουν τη βάση μιας έκθεσης αφίσας και θα παρουσιαστούν στο ευρύ κοινό κατά τις ημέρες διεξαγωγής του 3ου Graphic Stories Cyprus στη Λευκωσία. Το θέμα του διαγωνισμού “Λευκωσία, η πόλη της Ουτοπίας”, αλλά και η αντίστοιχη έκθεση αποτελούν δράσεις που έχουν ως γενικότερο στόχο μέσα από τους συμβολισμούς του σχεδίου των οχυρωματικών τειχών να προβάλουν την ιστορία, τον πολιτισμό, τις τέχνες και την αρχιτεκτονική μιας πόλης που υπήρξε αλλά και παραμένει μέχρι τις μέρες μας ένα σταυροδρόμι πολιτισμών, τεχνών και γραμμάτων που μπορεί να ατενίζει ένα μέλλον χωρίς τείχη και χωρίς σύνορα. Ο διαγωνισμός απευθύνεται αποκλειστικά και μόνο σε φοιτητές αλλά και επαγγελματίες σχεδιαστές οπτικής επικοινωνίας, ενώ κάθε διαγωνιζόμενος έχει δικαίωμα να καταθέσει ένα μόνο έργο του. Η κατάθεση των έργων μπορεί να γίνει μόνο ηλεκτρονικά από τις 10 Νοεμβρίου 2016 έως τις 20 Ιανουαρίου 2017. Περισσότερες λεπτομέρειες σχετικά με τον διαγωνισμό στην ιστοσελίδα της διοργάνωσης. The cornerstone of democratic practice, for many, a chance of the masses to express their will, for others and for us graphic designers a short trip in the Wonderland of Visual communication. The pre-election periods, and we have several in our country so that we do not to ever get bored, present huge interest for a designer. This interest is not limited to the professional or economic aspect but very often is the springboard for further research and analysis from both the aesthetic and semiology point of view. From the blockbuster of the presidential elections to the b-movies of the municipal elections, the scene looks at its base recurring and predictable. Candidates for search of popularity and growing awareness of one side and graphic designers in the role of magician Houdini on the other. And maybe the escape from the straitjacket does not belong to the professional skills of a designer of Visual communication, however the professional ups and downs of an election campaign are not far from leading in a tight embrace with this clothing. If as they say "the customer is always right" then the customer-candidate for mayor or consultant has admittedly the confirmation from his wife, his mother-in-law and his best man from Paphos, which surely knows of this subject, the infallibility of the Pope. Any resemblance to real persons or situations should be considered totally coincidental. The future star of local political life wants to send an open invitation to potential voters, but that does not mean that the style and aesthetics of this call should have emerged from the samples of wedding invitations of a local printing house. “Quality is not in quantity”, our ancient ancestors said and they only used one type of font, for all seasons. From any side someone looks at it, three fonts for three lines of text is at least degradation of aesthetic if not readability. As for using comic sans font, yes, we saw it at a bend of the road that almost became straight, to communicate the election promises of the candidate, testifies on its own their severity and the likelihood of their realization. 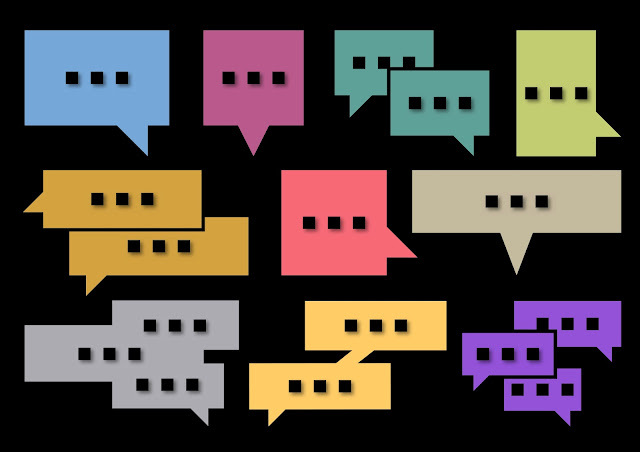 Visual communication of course is not just text and typography but also colors and images. Here usually we must do with the clichés of each era. Once the turtleneck was an indispensable garment for every promising politician, then followed the era of the red tie, while later we entered the European Union and the invoice for a suit was launched in four-digit numbers. Today is the era of open shirt. On one hand the financial crisis, so try to find money for the entire suit, and on the other hand the climate change, it did now rain for six straight months, forced the candidates not just to throw away their jackets but also to unbutton two buttons from the shirt. As for the hairy aspect of the subject thankfully we have Photoshop. Not forgetting of course, the necessary handshake with the President of the party. Warm and hearty manifesting acceptance and approval from the ... Chief and adds points to the candidate's profile and crosses of preference on the ballot. But to give credit were credit is due, there are not a few people who actually manage to harness the power of good visual communication for the benefit of public image, often by applying to the services of a professional designer, with the election result to be directly proportional to their presence during the pre election period. Even so it’s redundant, good luck! Ο θεμέλιος λίθος της δημοκρατικής πρακτικής, κατά πολλούς, μία ευκαιρία για να εκφραστεί η θέληση του απλού λαού, για κάποιους άλλους και για εμάς τους γραφίστες ένα σύντομο ταξίδι στη χώρα των θαυμάτων της οπτικής επικοινωνίας. Πραγματικά οι προεκλογικές περίοδοι, και έχουμε πολλές τέτοιες στον τόπο μας για να μην πλήττουμε ποτέ, παρουσιάζουν τεράστιο ενδιαφέρον για έναν σχεδιαστή. Το ενδιαφέρον αυτό δεν περιορίζεται μόνο στην επαγγελματική ή και οικονομική πλευρά του θέματος αλλά πολύ συχνά αποτελεί και το εφαλτήριο για περαιτέρω έρευνα και ανάλυση τόσο από αισθητικής, όσο και από σημειολογικής πλευράς. Από το blockbuster των προεδρικών εκλογών, μέχρι τα b-movies των δημοτικών το σκηνικό μοιάζει στη βάση του επαναλαμβανόμενο και προβλέψιμο. Υποψήφιοι προς αναζήτηση δημοτικότητας και καλλιέργεια αναγνωρισιμότητας από τη μία πλευρά και γραφίστες στον ρόλο του μάγου Χουντίνι από την άλλη. Και μπορεί η απόδραση από τον ζουρλομανδύα να μην ανήκει στις επαγγελματικές δεξιότητες ενός σχεδιαστή οπτικής επικοινωνίας όμως οι επαγγελματικές αντιξοότητες της προεκλογικής περιόδου δεν απέχουν πολύ από το να τον οδηγήσουν σε ένα στενό εναγκαλισμό με το εν λόγω ένδυμα. Αν όπως λένε «ο πελάτης έχει πάντα δίκιο» τότε ο πελάτης υποψήφιος δήμαρχος ή δημοτικός σύμβουλος έχει κατά κοινή ομολογία του ιδίου, της γυναίκας του, της πεθεράς του και του Πάμπου του κουμπάρου από την Πάφο, που σημειωτέον ξέρει από αυτά, το αλάθητο του Πάπα. Κάθε ομοιότητα με υπαρκτά πρόσωπα ή καταστάσεις να θεωρηθεί εντελώς συμπτωματική. Μπορεί ο μέλλον αστέρας της τοπικής πολιτικής ζωής να θέλει να απευθύνει ανοικτή πρόσκληση προς τους πιθανούς ψηφοφόρους του, αυτό όμως δεν σημαίνει ότι το ύφος και η αισθητική της πρόσκλησης αυτής θα πρέπει να έχει προκύψει από τα δειγματολόγια προσκλητηρίων γάμου του επίσης τοπικού τυπογραφείου. «Ουκ εν τω πολλώ το ευ» έλεγαν οι αρχαίοι ημών πρόγονοι και είχαν μόνο μία γραμματοσειρά, για όλες τις εποχές του χρόνου. Από όποια πλευρά και να το δει κάποιος, τρεις γραμματοσειρές για τρεις γραμμές κείμενο είναι το λιγότερο υποβάθμιση της αισθητικής αν όχι της αναγνωσιμότητας του. Όσο για τη χρήση της γραμματοσειράς comic sans, ναι το είδαμε και αυτό σε μια στροφή του δρόμου που παραλίγο να γίνει ευθεία, για την επικοινωνία των προεκλογικών υποσχέσεων του υποψηφίου, από μόνη της μαρτυρά τη σοβαρότητά τους και την πιθανότητα πραγματοποίησης τους. Η οπτική επικοινωνία βέβαια δεν είναι μόνο κείμενο και τυπογραφία αλλά ταυτόχρονα και χρώματα και εικόνες. Εδώ συνήθως έχουμε να κάνουμε με τα κλισέ της κάθε εποχής. Κάποτε ήταν το ζιβάγκο απαραίτητο ένδυμα για κάθε φέρελπι πολιτευόμενο, έπειτα ακολούθησε η εποχή της κόκκινης γραβάτας, ενώ αργότερα μπήκαμε στην Ευρωπαϊκή ένωση και το τιμολόγιο για ένα κοστούμι εκτοξεύθηκε σε τετραψήφια νούμερα. Σήμερα διάγουμε την εποχή του ανοικτού πουκάμισου. Από τη μια η οικονομική κρίση και που να βρεις λεφτά για ολόκληρο κουστούμι και από την άλλη η κλιματική αλλαγή, που είχε να βρέξει έξι μήνες, ανάγκασε τους υποψήφιους πολιτευτές όχι μόνο να πετάξουν τα σακάκια τους αλλά να ξεκουμπώσουν και δυο κουμπιά από το πουκάμισό τους. Όσο για το δασύτριχο του θέματος ας όψεται το Photoshop. Να μην ξεχάσουμε βέβαια και την απαραίτητη χειραψία με τον πρόεδρο του κόμματος. Ζεστή και εγκάρδια φανερώνει την αποδοχή και την έγκριση του ... Μάστρου και προσθέτει μονάδες στο προφίλ του υποψηφίου και σταυρούς προτίμησης στο ψηφοδέλτιο. Για να αποδώσουμε όμως «τά του Καίσαρος τω Καίσαρι», δεν είναι και λίγοι εκείνοι που πραγματικά καταφέρνουν να αξιοποιήσουν τη δύναμη της ορθής οπτικής επικοινωνίας προς όφελος της δημόσιας εικόνας τους, συχνά αποτεινόμενοι στις υπηρεσίες ενός επαγγελματία σχεδιαστή, με το εκλογικό αποτέλεσμα να είναι ευθέως ανάλογο της προεκλογικής τους παρουσίας. Έστω και πλεοναστικά λοιπόν, καλή επιτυχία! Το άλλο μισό, κατά τον ποιητή, «το αιώνιο και το αμετάβλητο» εμπεριέχει την έννοια του διαχρονικού, εκείνου δηλαδή που ως πόνημα μιας κοπιαστικής και χρονοβόρας διαδικασίας διατήρησε σταθερή την αξία του στον χρόνο και αναλλοίωτη την ποιότητά του. Στο σημείο αυτό εντοπίζεται και η μεγάλη διαφορά ανάμεσα στον επαγγελματία της οπτικής επικοινωνίας και τον ερασιτέχνη. Ο πρώτος επιδιώκει την ποιότητα έστω και μέσα από την επιλεκτική διαλογή των πελατών με τους οποίους προτίθεται να συνεργαστεί, ενώ ο δεύτερος την ποσότητα μέσω εκπτώσεων τόσο στην τιμή των προσφερόμενων υπηρεσιών όσο και στην ποιότητα της εργασίας του. Το ενδιαφέρον της όλης υπόθεσης έγκειται στο γεγονός ότι μακροπρόθεσμα και οι δυο πλευρές, πελάτης και σχεδιαστής, ζημιώνονται από αυτή την πρακτική. Ο πελάτης προφανώς λαμβάνει ένα προϊόν όχι απλά χαμηλής τιμής αλλά εν τέλει και χαμηλής επικοινωνιακής αξίας, ενώ ο σχεδιαστής ευτελίζει την αξία του επαγγέλματος και του κλάδου γενικότερα, δημιουργεί κορεσμό στην αγορά και τελικά απαξιώνει ακόμα και την ίδια την επαγγελματική του υπόσταση. Δυστυχώς αυτό που αδυνατούν να αντιληφθούν αρκετοί είναι ότι όταν ξεκινήσει η καθοδική πορεία των εκπτώσεων πολύ δύσκολα αναχαιτίζεται. Σε αντίθεση με τη βιομηχανία ιματισμού ή αυτή των εποχιακών ειδών, που οι χρονικές περίοδοι των εκπτώσεων έχουν καθορισμένη διάρκεια και στοχεύουν στην τόνωση της αγοράς, η λογική της βιομηχανίας της οπτικής επικοινωνίας δεν συνάδει με αυτήν των εκπτώσεων. Όπως και να το κάνουμε, δεν μπορείς να «ψωνίσεις» τρεις μακέτες μισοτιμής τον Αύγουστο για την επόμενη σεζόν.